For Lidya Buzio the forms of traditional vessels are the starting point for an untraditional treatment that employs contemporary aesthetics and techniques. 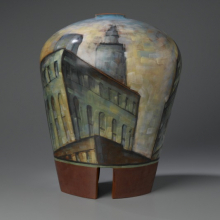 After the basic shape is selected, the artist draws urban scenes, frequently based on New York cityscapes, on the fired clay form. 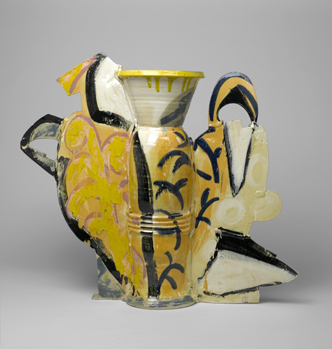 Each vessel is a work in progress as the artist reevaluates the results and develops the piece by adding color and detail with pigmented slips. She burnishes the surface carefully before firing and then waxes it lightly. Roxanne Swentzell’s work often plays on the interaction between native and non-native worlds. Here, she uses clay, an ancient artistic medium, to depict a traditional Pueblo woman, whose face looks much like Swentzell’s. 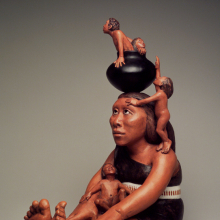 The woman in the sculpture looks up at the Santa Clara black pot balanced on her head, from which babies emerge. But there is a contemporary, ironic twist in what the woman is doing: is she “birthing” pots to be sold at an Indian market, or is it the baby Indians themselves that the consumer will want to buy? The work suggests the stereotypes still held by many non-native people who believe Indians are a commodity, stereotypes the artist is challenging the viewer to acknowledge. 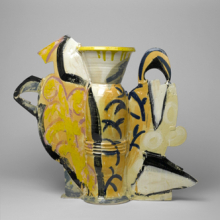 To complement the opening of the Elizabeth A. Sackler Center for Feminist Art, there is an installation of ceramics from the permanent collection made by women artists. Over 75 objects are included. Although the vast majority of the objects are by 20th century artists, there are also some earlier examples of “china painting” by largely anonymous women of the late 19th and early 20th centuries in both the Aesthetic Movement and Arts and Crafts styles. Examples of pots by Native American artisans are also included. Native American women in the Southwest pueblos of North America have been making pottery for over two thousand years. Today the potters still dig their own clay (often from sites known only to them), process it, and form the pottery without a wheel, using hand built and coiled methods. The slips are made from ground ochre, natural plant pigments, and ground rocks. Firing is done in open fires although a few potters today may use kilns. Pottery was essential to native life, with vessels serving as the keepers of traditional ways. Pots serve not only religious but also utilitarian purposes. For contemporary potters, claywork may also provide a living, as well as fame for those who compete outside Native communities, entering the art marketplace through festivals, Indian markets such as those in Santa Fe, and fine art galleries.